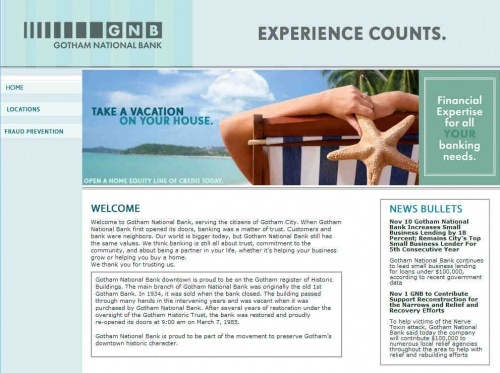 Gothamnationalbank.com is the website of the Gotham National Bank. Welcome to Gotham National Bank, serving the citizens of Gotham City. When Gotham National Bank first opened its doors, banking was a matter of trust. Customers and bank were neighbors. Our world is bigger today, but Gotham National Bank still has the same values. We think banking is still all about trust, commitment to the community, and about being a partner in your life, whether it's helping your business grow or helping you buy a home. We thank you for trusting us. Gotham National Bank downtown is proud to be on the Gotham register of Historic Buildings. The main branch of Gotham National Bank was originally the old 1st Gotham Bank. In 1934, it was sold when the bank closed. The building passed through many hands in the intervening years and was vacant when it was purchased by Gotham National Bank. After several years of restoration under the oversight of the Gotham Historic Trust, the bank was restored and proudly re-opened its doors at 9:00 am on March 7, 1985. Gotham National Bank is proud to be part of the movement to preserve Gotham’s downtown historic character. 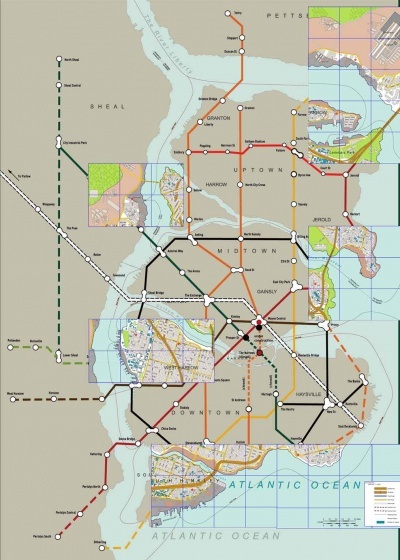 The website includes a map of ATM locations. Review account statements carefully. By regularly checking your balances and other account activity, especially online, you can more quickly detect and stop fraudulent activity. Ask about suspicious charges. Do not hesitate to contact Gotham National Bank or your credit card issuer if you see questionable charges. Cancel and cut up unused credit and other cards. If you have an open account that you no longer use, call the creditor to cancel it and cut up the card before throwing it out. Follow the same procedure for unused or expired cards of all types, including expired Gotham National check cards. Keep your ATM password secure. Do not use obvious or easily obtainable information (such as your birth date) for your password. Never share your password and avoid writing it down. Be aware of your surroundings and exercise caution when using an ATM. Using common sense will make your transactions safer. Limit personal information on checks. Do not have excess personal information, such as your driver's license number or Social Security number, printed on your checks. Store new and cancelled checks safely. And only carry your checkbook with you when necessary. Use tamper-resistant checks. Gotham National checks include many safety features such as tamper-resistant packaging and chemically sensitive paper to deter alterations. 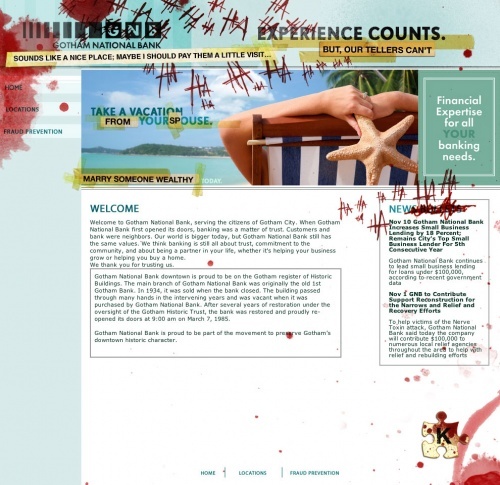 After the countdown ended on Whysoserious.com/Overture, Gothamnationalbank.com was "Jokerized" with nearly every other website in the game. 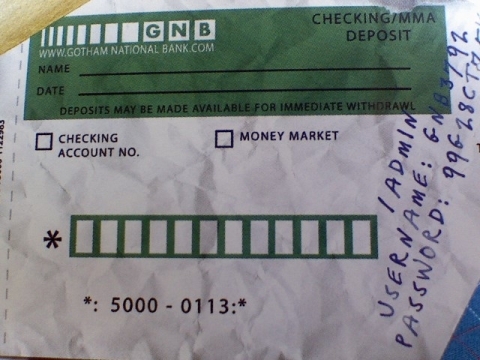 A Gotham National Bank deposit slip was packaged with the Batman Begins Limited Edition DVD Gift Set. Gothamnationalbank.com/Admin goes live. When the participant enters the information from the deposit slip (lowercase letters), they are able to access the email account of presumably the bank manager. In the IMAX prologue, the Joker leads a group of thugs to rob the Gotham National Bank. It is strongly implied that the bank is controlled by the mob. This page was last modified 18:18, 24 April 2012.